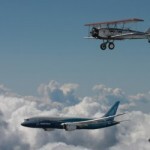 Yes, these are real photos of a Boeing 787 001 over Mount Rainier next to Boeing 40 C bi-plane, reportedly the oldest Boeing aircraft still flying. The shots were taken last Saturday. Test pilot Mike Carriker is at the throttle of the 787 Dreamliner (the one I witnessed first hand last Dec. 15 when the 787 and yes, this particular one, flew for the first time). “The Pemberton Family wants to thank the visionaries at The Boeing Company for their support in making some history this past Saturday. 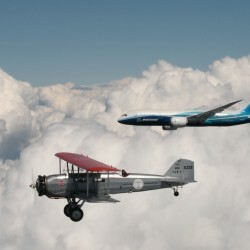 Boeing test pilot Mike Carriker flew Dreamliner serial number 001, the newest Boeing commercial aircraft, for some formation flyby shots with the Pemberton’s Model 40, the oldest flying Boeing commercial aircraft. The flights were just west of Mt. Rainier, Washington. My advice to the pilot of the 40C? Don’t get too close. A lot of people are wondering how the photos were taken since the planes fly at very different speeds. Do you have any insight? Absolutely no idea…..thanks for the comment..